ImageGrab is a nice utility aimed at extracting images from all kind of videos, also from Video CDs or SVCDs, and even from live video streams which are delivered to the computer by a webcam, a camcorder or an analog video capture card. 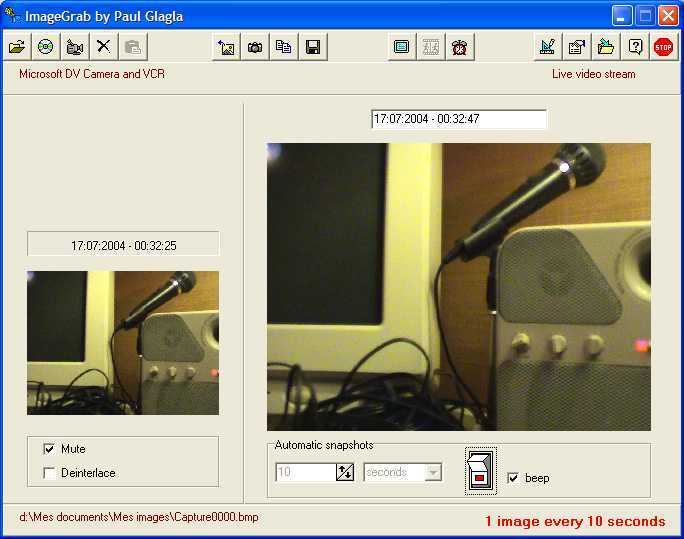 ImageGrab is a nice utility aimed at extracting images from all kind of videos, also from Video CDs or SVCDs, and even from live video streams which are delivered to the computer by a webcam, a camcorder or an analog video capture card. It includes a multimedia player able to play the video even in full screen, to seek precisely in the video, frame by frame, to catch pictures from the video either in bmp or jpeg format. The image may be easily corrected, in order to respect an aspect ratio of 4x3 or 16x9. ImageGrab is able to catch automatically a series of images at a scheduled interval.